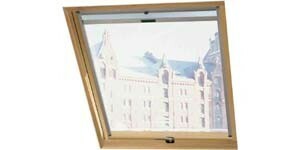 The best Pine Roof Window - Just look at the quality & the price! The R7 Timber Roof Window - with Top-Third Opener gives more headroom - has an internal frame manufactured from FSC Certified Scandinavian Pine components, and has weatherproof external aluminium cladding. QUOTE "JAS-R7" to Grant Barlow on the ROTO STAND and place your order to get the extra 5% DISCOUNT.